In today's column, Nick Cafardo of the Boston Globe ranks the top ten managers in baseball. Don Mattingly of the Dodgers tops the list as he has the club off to a surprising 38-22 record, putting them four games above the Giants in the NL West. Robin Ventura (White Sox), Terry Collins (Mets), Bobby Valentine (Red Sox), and Buck Showalter (Orioles) round out the top five. Here's more from Cafardo..
Only Kevin Towers knows for sure if the inconsistent Justin Upton could ever be available in a deal. However, a few baseball evaluators wouldn’t mind tempting the Diamondbacks with a package. Arizona doesn't need pitching, so the Red Sox can't use someone like Clay Buchholz to get him. The Phillies may be more interested in Will Middlebrooks than Kevin Youkilis, a major league source told Cafardo. However, it doesn't look like the Red Sox would have interest in dealing Middlebrooks. The Orioles' new six-year, $85MM deal with Adam Jones has led to speculation on how the Red Sox will approach Jacoby Ellsbury, who can be a free agent after the 2013 season. However, there's reason for both sides to wait. As an Oregon native who shuns the spotlight, Ellsbury may want a quieter market. The Sox, meanwhile, would want to see Ellsbury stay healthy for a while before committing 6-8 years to him. While the Mariners haven’t given indications that they will sell off veteran pieces, teams are targeting them as a seller. The M's have already received some inquiries for Brandon League. The Rays have to be looking for a middle infielder, which are extremely hard to come by. Tampa Bay is anxious to upgrade from the defensive play of Sean Rodriguez. The Red Sox really like Jorge Soler, but they don’t appear to be the front-runners for him. Why would Red Sox want to trade him? There are some interesting guys like Olt, Seager/Liddi/Franklin, or Cox (and they just drafted another 3B) that could be available because of being blocked…not Middlebrooks. Just like the Phillies aren’t getting Middlebrooks, the Red Sox aren’t getting Justin Upton. You left a key factor out.. Phillies have nothing to send in exchange/desirable who would be under control for over half a season..
I’d send them Middlebrooks for one of their Aces. It still does not make sense to move him for reasons gave lower in the topic.. The next 3b they have with a chance is Cecchini, or the closest.. Then maybe Bogaerts if he plays 3b.. Vitek isn’t going to cut it.. Spears is a nothing.. They will have to pick up Youk’s 13m option next year forcefully..Intend to or not out of no other option. As it is, moving Middlebrooks would be a very poor decision and switching Aviles to 3b, letting Iglesias play SS next season even worse and all that to get 2 months of Hamels, or 100m of Lee’s salary? No thanks. Well, with a trade for Hamels they can ask for a signing period to get him signed to an extension (like they did with Gonzalez) or no deal, so it wouldn’t have to be for 2 months of Hamels. Lee would be a great addition for the Sox, but where they are trying to get under the luxury ta threshold by 2014 you’re right that he might not be their first choice (they could always get creative with moving other guys around so there’s a bit of a salary swap, or send additional talent and get the Phillies to pay some of the contract though). I also only mentioned them because they were the topic of this thread, but there are other teams who are looking for corner infielders who would presumably prefer Middlebrooks over Youkilis who also have top of the rotation type starters who could be moved, so it wouldn’t necessarily have to be Hamels or Lee. You clearly don’t know anything about the Phillies system. Don’t believe everything you read, do some research for yourself. The Phillies happen to have a plethora of young top-tier pitching. The Red Sox (as far as I know) do not. Plus their current rotation is pretty bad. Practice what you preach, man. Sox low A(Salem, Greenville) is loaded with talent. Even double A has a few guys with lots of potential. It’s just Pawtucket that’s lacking prospects with a lot of upside, aside from Lavarnway and Iglesias. Sure nothing major league ready yet but they’re in good shape for the future. Well I look at Boston having two SP in their top 10 prospects vs. the Phillies four, two of whom are having good seasons in AA. Although May has gotten touched in his last two starts. The difference is that the majority of the Phillies top 10 guys wouldn’t crack the top 10 of other teams prospects. You seem to think that just because the Phillies have a top 10 prospects it means they’re all good. There’s not much upside in that group and most of the power arms that do have upside are still either at the very lowest levels, struggling with command, or both. Every team has a top 10 prospect list, but not all top 10 lists are equal. Trevor May, their consensus top prospect coming into the season, would likely fall somewhere around 5th in Boston’s current farm system. That’s not to take anything away from May, just to show that those four pitchers in Phillies top ten wouldn’t likely be in Boston’s top ten, so you can’t really compare the two that way. LOL “do some research for yourself” about philly, then “as far as I know” bout boston. good call Stan. Biddle looks good, but he’s in A ball and May has struggled with the transition to AA. Beyond that there aren’t really any big upside arms that have shown enough to be major parts of a deal that lands a young bat like Middlebrooks. Middlebrooks would’ve been far and away the Phillies best prospect coming into 2012 and his stock has skyrocketed since the season opened and most of the Phillies top prospects coming into the year have seen their value dip a bit. I don’t know what kind of research you’re doing but the Phillies certainly don’t possess the pieces to get a Middlebrooks deal done unless it involves one of their great big league pitchers. I’ll be a little surprised if they can even scrape together the kind of young pitching the Red Sox want to land Youkilis without breaking up their current rotation or completely cleaning out their already barren farm system. I just thought that was all assumed. But, yes. Seriously.. The MLB Philly roster is on the older side and is built to win now.. Why would they want to give up a large prospect package in exchange for Middlebrooks and then.. Boston’s top players are at the lower levels also (as you know) and even a fit possible at all.. I can’t see Philly going the expensive acquisition route in going for the possible higher cost to acquire player really, though interested in hearing your reasons. Jesse Biddle, but that would be for Youk, not Middlebrooks. …they could sign him in a couple months and keep Middlebrooks.. I see Rangers, Angels, Pirates, Cardinals, Tigers, and Indians being very aggressive. How bout Victorino to Pirates? That’d be interesting. why would the Rangers go after Hamels? That doesn’t make sense for them considering what it would take to acquire him. Exactly what would it take though? The returns for SP traded mid-season in recent years have not been good. Olt for Hamels? Why wouldn’t they with the injuries. Plus, if they don’t and the Angels get him, they could be in trouble. For half a season? Why not just wait til hes a free agent and sign him? …because not having him on their roster for half a season would be worse than having him? And you then not only don’t have to give up a compensatory pick if you sign him as a FA, but you also receive 2 picks if you get out-bid for him in the offseason. didn’t the new CBA change that rule, so teams only get a comp pick if the player stays with them for the whole season? That doesn’t help you win this year. Now that is one weak set of rumors/thoughts. Nothing about Joe Blanton being dangled for Josh Hamilton or something this week? Man, where do you even start with this one? Bobby Valentine is the fourth best manager in the game? Really? Now is not the time to be trading Buchholz anyway, his value hasn’t been lower in years. And the last thing this team needs to do is trade away pitching for more offense. I’m going to guess that pretty much everyone would be more interested in Middlebrooks than Youkilis (with the possible exception of teams with an established 3B who are specifically looking for a 1B). He basically says Kendrick was right about Drew, and says Boras is only looking out for the player “just as he did with Jacoby Ellsbury a couple of years back.” The most ridiculous thing a player and/or agent can do in that situation is try to take as long as possible to get back on the field; the only way they can build any value back is by playing, and the longer they sit out the lower their value goes. I’ll also just say that I would actually be in favor of trading Middlebrooks (assuming, of course, that they got good value for him). Not set against it.. He could be the next Ted Cox (look him up from Eck to Indians if you like) who made a huge splash on the field for a month and a half.. Long enough to get valued highly enough to help Boston land Eckersley.. The next real 3b the Sox have is Cecchini though.. Spears is nothing, Vitkek either and that motley collection at Salem have little faith in either.. They move Middlebrooks and then they must pick up Youk’s 13m option next year.. Costing the team money and take years longer for the next 3b to come along.. Please think of those 2 scenarios and Boston also unless they think Middlebrooks plate discipline is something that will get exploited as a weakness more and more. Don’t get me wrong, I’m not saying I want them to trade him, but if they could get a true top of the rotation starter by trading him it would be well worth it. They still have Youkilis for next year, and they can always get a stopgap type after that if the younger guys aren’t ready by then. There’s also a chance that Vitek turns out to be useable player, or that Cecchini is ready by then (both maybe slim chances). And while it wouldn’t be ideal they could always put Aviles at 3B for a year with Iglesais at SS. Understand where you are coming from also here. Remember there is a decent shortage of average to above 3b in the game ATM and Middlebrooks is right now a future above average one with 6 years of control. Now.. If by involving him in a move for a top of the rotation pitcher.. not a 3 month rental.. Out of the question.. 3b (for reasons described) are nearly as rare as catchers ATM. Vitek (from what have read) needs to learn how to field the 3b position and has no power (yet) to go along with his struggles.. I see Cecchini passing him within a year or 2 and Bogaerts next season if they move him F/T to 3b. The scenarios both of us have thrown out however involving Middlebrooks being moved and possible replacements are iffy at best. Planning on long term development from several high end people at A ball, or Aviles to go to 3b and his non patie4nce approach at the plate which pitchers have finally figured out. They might be better off getting the O’s to pay most of Reynolds deal and stick cast iron glove himself at 3b for a season.. Back to the Butch Hobson days of “no d/high K, but hit the ball a mile” he always was. The fact that 3 of their top 5 and 4 of their top 10 prospects are third basemen makes it a bit easier to swallow, and any time you can upgrade a position of weakness by dealing from a position of strength it is likely a good move, but you are right that it wouldn’t be without its risks. Yeah, his BABIP suggests he is over achieving, bit I like him a lot. Good player. There’s one little balancing fact that you’re not factoring into that equation. It behooves the player to get back and establish value. But it doesn’t behoove the player to come back if they will potentially play poorly. Boras will stall Drew’s return if there is any reason why he won’t come back as a superlative player, because sucking would hurt his value more than delaying. At this point, I think its more Drew’s state of mind and not the injury that has Boras worried about “how” he would perform. Nobody expects great performance coming back from a long layoff like that; they use scouts to look for talent and ability. Obviously a scout would be able to tell if his timing is off or whatever, and be able to say that yeah, the talent is still there. Getting labelled as fragile or injury prone is going to hurt his value a lot more than struggling after missing more than a year (that’s to be expected). Why in the world would the Diamondbacks even remotely consider trading Upton for Buchholz even if they needed pitching. lol it would take more then buchholz, the redsox would practically have to clean out their farm for upton. I wouldnt mind seeing the yankees getting him, but not at the price of the farm system. but i doubt the dbacks would really trade upton. it could be talk to light a fire under his @** to get him to start hitting. Umh guys, he says “can’t use Buck”. And never equates their talents. It would take a package deal. No he said you can’t dangle a Clay Buchholz (MLBtr re-worded the article). I doubt any Gm is salivating at the prospect of getting Buchholz especially in a deal for a guy like Upton. Even in a package Buchholz would be a throw in like Volquez was in the Latos deal. Slow day so the old rumor mill is in full force – was there anything about those magical “unnamed sources?” Color me in as a cynic with 99.9% of the rumors since it usually is fabrication or too much wine on the part of the monger. The Red Sox have a rather substantial commitment via contract to Beckett, Lester and Buchholz. Then they have Lackey to return in 2013 and the emergence of Dubrount. Who knows what awaits with the enigmatic Dice-K and Bard? The Sox have also decided to do some payroll paring and that means Youk can start packing since Middlebrooks will be baseball cheap for a few years. Ellsbury is a dynamic player but with the long term commitment to Crawford it is a duplication of services and – who knows – maybe Kalish is the real deal. I just can’t see the Sox moving in on either Upton or the soon to be quite pricy Hamels. 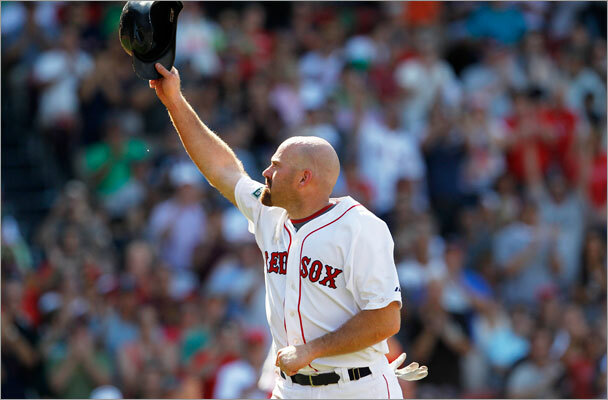 The goal is to get under the luxury tax by 2014, and Youkilis will be gone by then either way. They have already acknowledged that they are going to be over the luxury tax threshold this year. I am pretty impressed with the job that Collins is doing a manager of the Mets. Other than David Wright and Johan Santana, I am not sure that the Mets have many players that impresss that much. Yet they are in the race in a highly competitive division. I don’t expect them to win, but I am impressed that they are able to compete. Me too. He certainly has gotten the most from the least. Of course it helps that two of their best players are healthy this year, but they have also had a large amount of players on the DL and virtually nothing (again) from Jason Bay and less than nothing from Ike Davis and Mike Pelfrey blew his arm out. Dickey, Captain Kirk, and Duda have performed well above expectations. The Mets have been scuffling as of late. Let’s see if he can get them back on track. The Phillies may be more interested in Will Middlebrooks than Kevin Youkilis. Hmmm, I never thought about this. Although, would the Phillies trade Cliff Lee for him? Would the Sox want that in return? Why on earth would they trade Cliff Lee? Hamels seems destined for FA and Halladay is injured (and could be a FA), Blanton is a a BUM and a FA. SO depending on who they would sign next year the Rotation would be Halladay, Worley, Kendrick, and pick from May, Bush/Elarton (if signed for another year) Cloyd, Hyatt. Now if they did indeed trade both Lee and Hamels that would be a lot of talent brought back to the team, just cant see them trading Lee and signing Hamels for 7 years! Figgins/Prospects to the Phillies with Victorino to the Red Sox because an Outfield of Shae/Jacob and Crawford would be good and Youklis to Mariners? Figgins??? Really??? What would that solve for the Phillies? How is Bobby V a top five manager? They have been in last place most of the year and he has been far from brilliant handling what he has. Because their top outfielders are hurt and their closer has been out. I see why he says that, but I don’t agree with it. Once again, its about doing the most with the least. The Sox had something like 8 starting players on the DL, and somehow, BV has managed to keep them within 4 games of the lead in the division. He certainly has managed the bullpen well – one of the best in MLB for May. His outfield is made up of replacement players and a starting first baseman who alternates in right to make space for Youk. It’s a hell of a juggling act. And yet he doesn’t put Joe Maddon in his top 10. The Rays have been without their closer all season, their best player for 2/3 of the season and their lead off hitter for almost half. At one point a few weeks ago they had 10 guys on the DL and were starting multiple replacement level players. All Maddon has been able to do during all this is lead the Rays to the best record in the AL. The Red Sox have also been without their closer, their best hitter and Crawford and have had alot on the DL also this season. It is about kissing up to the Red Sox/Valentine so he has access (Boston writer). Valentine developed a reputation in NY as someone who shut out any reporter who was overly critical of him. As a Sox fan since 1952 I have to say Bobby V. is the best manager in the game. Man….this Jack Daniels stuff is great for breakfast. Anyways…..I may reconsider….Pinky Higgins was damn good, also. 3B intill a Prospect is ready and can play other postions to. Millwood/League packaged & shipped. Name your price sir!! You almost always get more value trading players separately than you do packaging them together. Millwood, League, Gutierrez, Olivo and Ryan – gone. For who and how many is the obvious question, but none of them truly play into the long-term plans of the M’s and/or their value more than likely won’t be any higher than it is now. I’d also try and get something for Ichiro, but I’m sure he would block most anything at this point in his career. I would also shop Carp around. My understanding is he has no more options so moving him down won’t be done and keeping him here may prove to be a wasted slot of the roster. I’d keep Ryan for another year. I hate him, but his glove is making him on pace for 6 WAR for the year. Franklin wont be up till next summer so keep up and trade him next year, who’s gonna replace Ryan anyway? Considering the M’s (it will never happen) put all the guys I listed on the block and actually trade some of them, then who knows what will be received in return. Typical Boston writer leaves Joe Maddon who should be coach of the year. First place in the AL East, 11 players on the disable list.